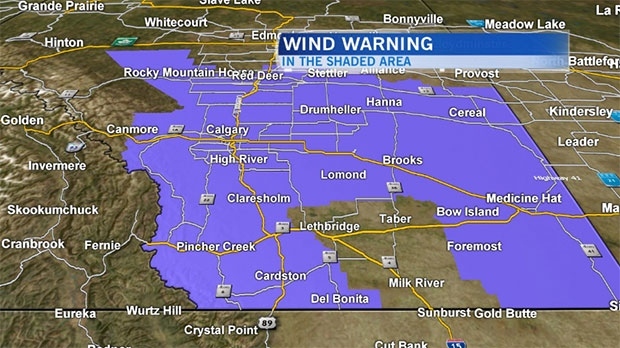 Environment Canada has issued a wind warning for many parts of central and southern Alberta and Calgary’s Emergency Management Agency is asking people to secure outside property as winds are expected to exceed 90km/h in some areas. The weather agency says a cold front will move across the province on Friday and will bring strong winds with it that could cause damage to property. 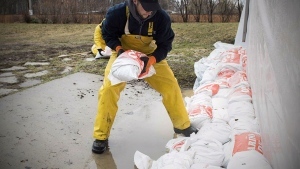 The weather system will come out of the northwest and winds could exceed 90km/h in some parts of the province. The high winds could break trees and toss around unsecured items on balconies and patios and people are being advised to take precautions. “We know that it’s going to get very windy today so make sure that all of the things around your yard and around your home are secure or put them away, things that can easily become projectiles. If you have branches that come down on power lines make sure that you call 911 right away and do not approach because that is very dangerous. If you work on a construction site or doing construction in and around your home, make sure that all of those materials are secure,” said Carol Henke, CFD Public Information Officer. The wind is expected to taper off on Friday evening. Download the CTV Calgary Sky Watch Weather App for real-time weather forecasts and video updates on conditions HERE. For updated information regarding weather warnings and watches, visit Environment Canada – Public Weather Alerts. Environment Canada has issued a wind warning and says winds could exceed 90 km/h in some areas on Friday.